Barbecue is one of the finest and authentic cooking style. It is one of the very popular and most loved cooking styles. 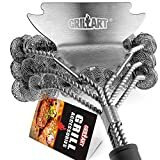 We know that people don’t like to complicate their grilling activity by using too many tools, but the use of some special accessories will make grilling more comfortable. So if you love grilling or smoking food and own a grill or a food smoker, then you may like this article to get a better experience. We’re listing some of the very popular and useful tools, which are surely going to help you in grilling. 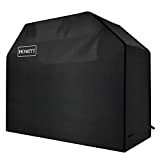 The first thing you are supposed to do when you buy the best electric smoker or a grill is to protect them from dirt and bad weather conditions. That’s why the safety of your BBQ device should be on high priority. These covers are waterproof and come in 9 different sizes. So it’s quite clear that you’ll easily find one for your unit. 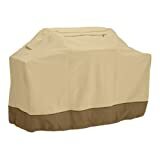 These covers are made of Gardelle fabric system that makes them waterproof. Being waterproof, your unit will always be prevented from all those unwanted messes. Moreover, this will also make your device more durable and also maintain its performance. One of the most important accessories for any device is the cleaning tool. And if we talk about grills, then it’s a must-have tool to make sure that the delicate foodstuffs (veggies and fishes) don’t stick. You might have found some models that come with stiff brass bristles, which get deformed or broke off. Due to this, the cleaning process gets a bit more difficult and challenging. 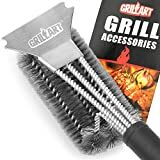 So we recommend you to look for grill cleaning brush having solid bristles, made of stainless steel woven wire. Also, make sure that the handle of the brush is quite long that can clean every part of the unit. Many users won’t have heard about this accessory. A BBQ Dragon is a high power cooling fan which is attached to a clamp by a 180° pipe attached to a vertical pipe (called as gooseneck). 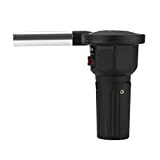 The manufacturers of this tool claim that this would help users to light up the charcoal fire, which is a time-consuming activity. These BBQ Dragons are rechargeable, and you can use your normal USB cables to charge it. Also, there’s an option to control the speed of the fan, which can be set multiple levels. You might be thinking about how much effective this BBQ dragon is? We would like to tell you that it can light up the charcoal BBQ in very few minutes. One of the essential BBQ accessories is the thermometer. 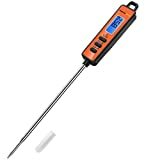 This instant read thermometer has a probe that can be inserted into the meat, placed on the grill. And within the time of just 3 seconds, it’ll provide you the internal temperature of your meat. This tool comes with a digital display which is very easy to read. With the help of this tool, users will know the exact temperature of the meat that would help them to get perfectly cooked meat. Moreover, they can also prevent over-smoking of the food. So if you’re planning to prepare a perfectly cooked BBQ, then you simply can’t play with the temperature of the unit. Therefore, it’s another important tool. There are situations when you’ve to handle your food with your hands. At such situations, using grilling tongs or spatula may not prove to be that effective. 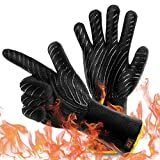 So what we recommend you to buy a pair of heat resistant gloves that can be used for removing roasts from smokers. These gloves are made of heavy-duty suede along with silicone or cotton lining. 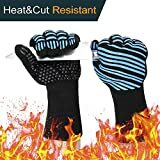 These gloves not only prevents the food from getting burnt but also prevents your hands. And being made of silicone, the gloves are comfortable to wear and also provides good grip over the food. So if you’re worried about your safety, then you should not hesitate to buy a new pair for yourself. Accessories are something that makes your job very simple and comfortable. 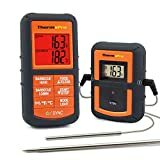 And if you wishes to get perfectly cooked BBQ at your place, then you may check out the above listed tools which will be very helpful to have a great BBQ experience.